These are simple and quick for little Christmas toppers on a gift or to have next to your coffee or hot chocolate at a party. In microwave, melt semisweet chips; stir until smooth. 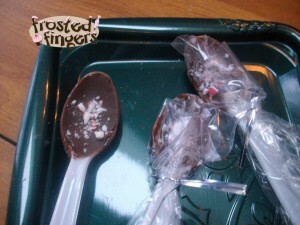 Tap the handle of the spoon on the edge of the bowl to remove excess chocolate. Place spoons on waxed paper. These are great to add to hot chocolate packets and a mug for a teacher gift for the holidays. That’s a great idea, I bet coffee would taste fab with those as stirrers!